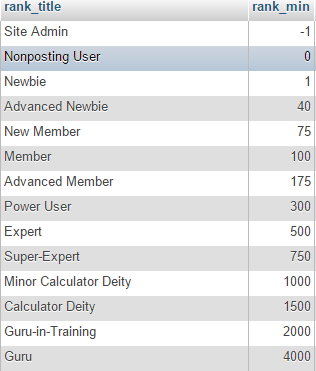 Do you know how many posts it takes to get to the next levels like 'Advanced Newbie' and Power User, and the other levels. I'd yell at you to use the search bar, but for some reason it never brings up the correct topic so no fault to you. © Copyright 2000-2019 Cemetech & Christopher Mitchell :: Page Execution Time: 0.144985 seconds.